The Lord of the Rings: The Motion Picture Trilogy will be yours at Amazon for only $43.49 with free shipping during checkout. Deluxe 15-Disc Set Includes 9 Special Features DVDs with over 26 Hours of Spellbinding Behind-the-Moviemaking Material Including the Rare Costa Botes Documentaries. The Lord Of The Rings: The Fellowship Of The Ring Extended Edition: With the help of a courageous fellowship of friends and allies, Frodo embarks on a perilous mission to destroy the legendary One Ring. The Lord Of The Rings: The Two Towers Extended Edition: In the middle chapter of this historic movie trilogy, the Fellowship is broken but its quest to destroy the One Ring continues. 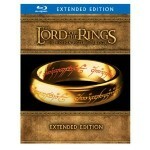 The Lord Of The Rings: The Return Of The King Extended Edition: The final battle for Middle-earth begins. Frodo and Sam, led by Gollum, continue their dangerous mission toward the fires of Mount Doom in order to destroy the One Ring.